This article describes the ObservableGraphSourceBase class defined in the Diagramming Extensions. The ObservableGraphSourceBase derives from the GraphSourceBase class and it also implements the IObservableGraphSource interface. Its main purpose is to provide an out-of-the-box ViewModel implementation that supports TwoWay binding to the RadDiagram GraphSource property. If you need to define a data-bound RadDiagram that has to support drag and drop of items, then you need to make sure that your custom GraphSource implementation derives from the ObservableGraphSourceBase or from a class inheriting the ObservableGraphSourceBase class (for instance the SerializableGraphSourceBase class). Only then the drag/drop operations will be reflected in your ViewModels. CreateLink(object source, object target) Creates a new ILink object associated with the specified source and target nodes. CreateNode(IShape shape) Creates a new instance of the TNode type. And as it receives an IShape object, when you override it, you can use the IShape argument to create a TNode instance associated with the specified shape. 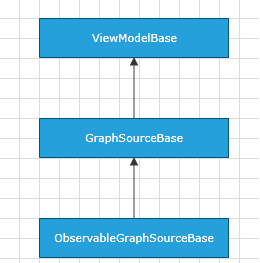 Please note that in your solution it is best to create a custom class deriving from ObservableGraphSourceBase. Once you do so, you will be able to override all of the above virtual methods. This will allow you to describe a custom RadDiagram GraphSource class that supports TwoWay binding scenarios where any changes in the RadDiagram UI are reflected in your GraphSource implementation.